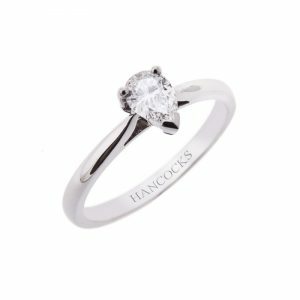 A truly perfect engagement ring embodies your personality, allowing your unique qualities, beliefs and values to be reflected upon the world. Fashion may come and go, but your engagement ring will sit on your finger forever, so it is essential that it is a true representation of yourself. 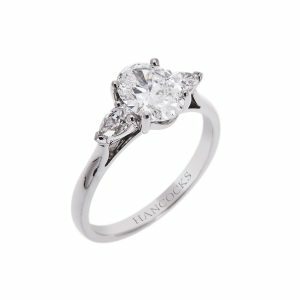 As one of the leading diamond engagement ring specialists in Manchester, Hancocks has a range of breathtaking rings suitable for every bride. While diamonds remain the most sought after stone for soon-to-be-weds, beautiful vibrant jewels such as sapphires, rubies and emeralds look equally as spectacular on an engagement ring. Meanwhile, yellow diamonds have also made their mark recently – the rare hue symbolises the fiery passion of your relationship. Choosing your stone is only half the battle, you are yet to decide on the setting and of course the cut because the shape of your engagement ring reveals a great deal about the wearer to the world. So, what does the shape of your engagement ring say about you? Otherwise known as a round cut, brilliant cut diamonds are the epitome of sophistication and class. Chosen for their timeless shape, a brilliant cut diamond is a simple choice for understated elegance and remains the most popular choice for diamond engagement rings. The ongoing circular shape of the stone symbolises a never-ending love, much like the wedding band itself. 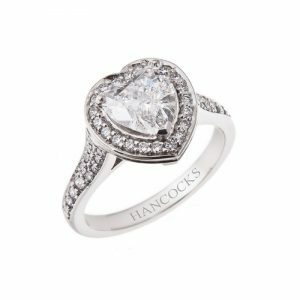 It can be worn either alone, or cushioned by a halo of diamonds like this beautiful platinum engagement ring with a brilliant cut diamond and diamond set halo. 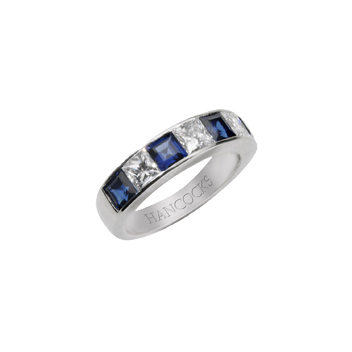 Opt for this ring if you are traditional, honest and have a classic style. A pear shaped stone is still traditional, but offers an individual twist on the classic round shape. A woman who chooses a pear shaped stone has a unique flair and maintains high standards, but she is also quite conservative when it comes to her values and beliefs. This modern yet sophisticated style of stone is perfect for a stylish bride who wants to convey her personality without breaking too far from tradition. Choose a classic ring with a platinum setting, such as this diamond pear ring, featuring sweeping under bezels to ensure that the light cascades beautifully around the diamond. The most unusual shape of all the stones, a heart shaped cut represents the bride’s feminine and romantic side. This cut of stone symbolises the enjoyment of falling in love and finding “The One”, most typically worn by spirited brides who are true romantics at heart. Wear this gemstone alone on a simple band, or adorn it with a plethora of breathtaking diamonds, such as this engagement ring, for an opulent and youthful appeal that a playful bride can’t resist. 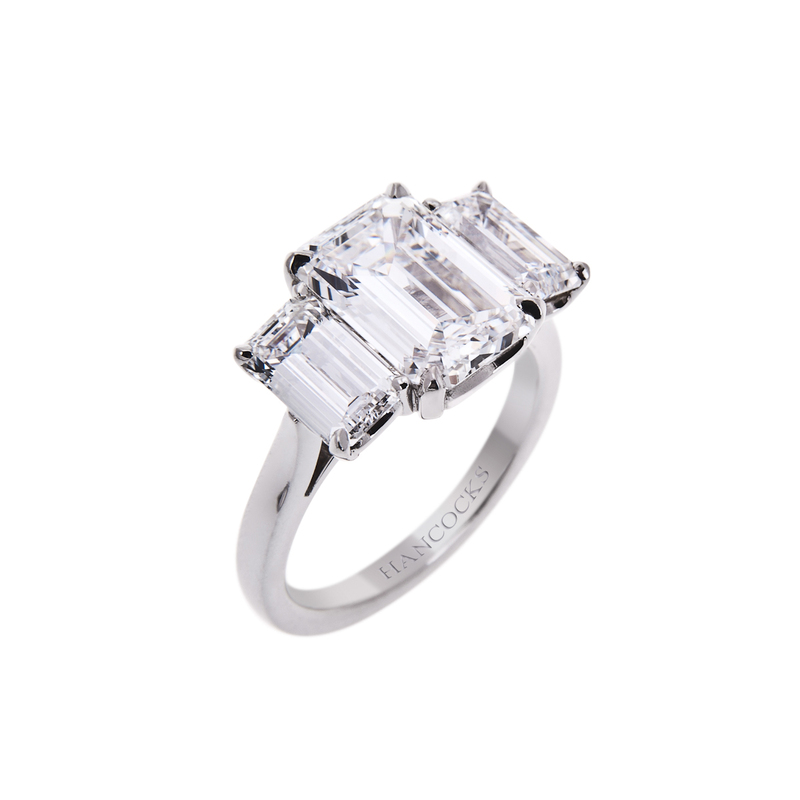 Emerald cut stones possess a quality that only a self-assured woman who has lived a vibrant life would share. Their rectangular and open shape allows you to see deep within the gem, so they are ideal for open, honest and genuine wearers. 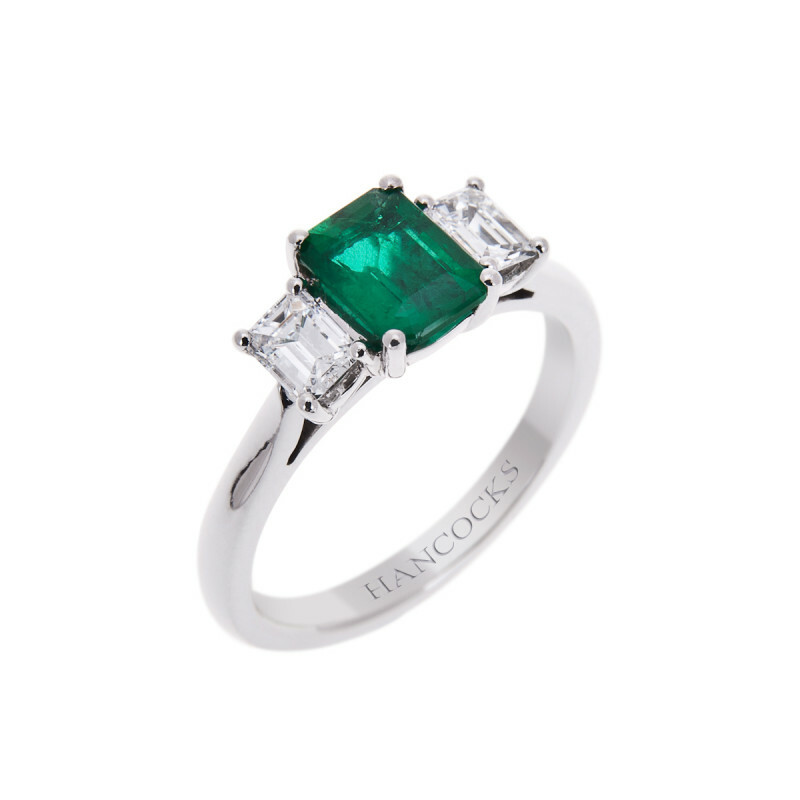 As the shape is quite large, emerald cuts tend to be favoured by a vivacious bride who wants to demonstrate her love to the entire world. Choose a vibrant coloured stone, such as this emerald and diamond engagement ring, to accentuate this dramatic cut. 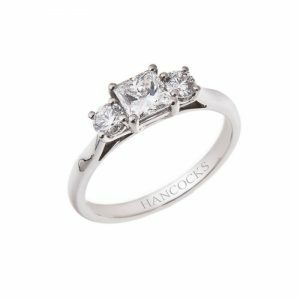 An engagement ring with an oval stone is just as traditional as a brilliant cut diamond, so it is a superb cut for a woman looking for a ring that is both classic and sublime. Oval stones are often linked with fertility, as they are a similar shape to an egg, making it an obvious choice for a woman whose desire is to start a family. This oval and pear cut diamond ring is the epitome of elegance, with three radiant stones mounted on top of a stunning platinum setting. 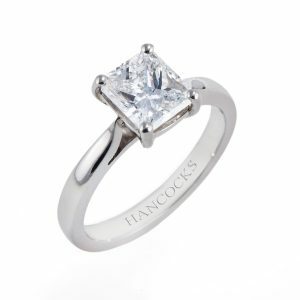 Without a doubt, a princess cut engagement ring is one of the most exquisite shapes you can choose. 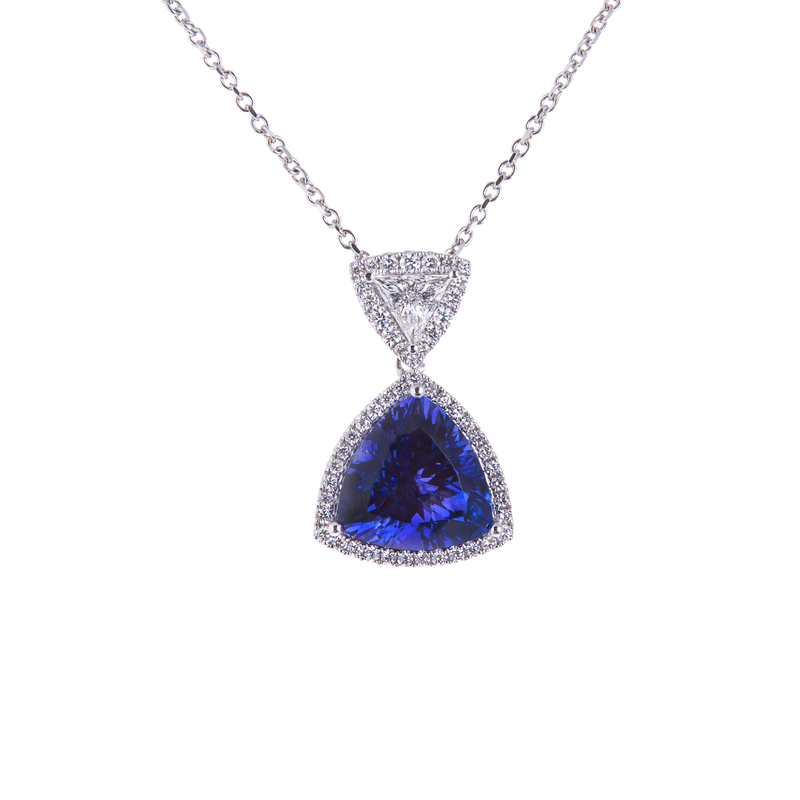 A princess shaped stone instantly draws attention as the light cascades from the jewel, exuding an air of opulence and class. Princess cuts are ideal for brides who are looking to be in the spotlight. This type of engagement ring is just the beginning of the spectacular life that is yet to come. Opt for a ring that is truly show stopping, such as this princess cut diamond three stone engagement ring with a platinum under claw setting, for a ring that demands to be noticed. True to its name, a radiant cut diamond is magnificent. You would be forgiven for being dazzled by the multifaceted sparkle of a radiant cut diamond, it’s an impressive stone which captures the light with every movement and catches the eyes of every onlooker in the room. This radiant cut engagement ring is truly exceptional, with a spectacular diamond halo that adorns each of the shoulders of the platinum band. Ideal for a woman who is confident, glamorous and enjoys the finer things in life, the wearer of a radiant cut engagement ring sparkles almost as much as the diamond itself. The distinctive shape of a marquise cut stone exudes opulence and style which makes it the ring of choice for a contemporary, fashion-conscious bride. The clean cut shape of this stone represents a fierce sense of independence, confidence and style. The elongated shape is synonymous with loyalty, faith and devotion. As the marquise stone is such a significant shape, keep the rest of the ring very simple so as not to draw attention away from the main event. 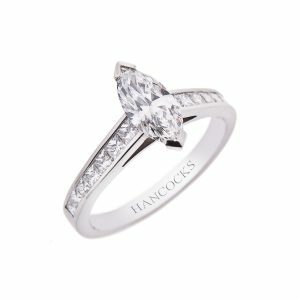 This platinum marquise cut engagement ring is perfect. The style of an asscher ring has a vintage quality, echoing the style of dramatic jewellery from the past. Similar to the emerald shape, its depth conveys a sense of openness to the wearer. This ring is perfect for someone who is passionate, loving and kind. Whatever style of cut you choose, ensure that your ring is the perfect fit. 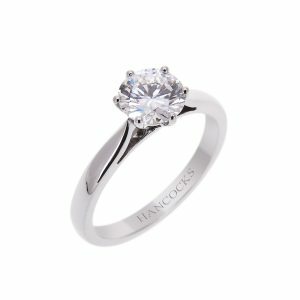 Every ring at Hancocks is specially crafted to fit your finger perfectly, and we offer a unique polishing service so that you can bring your ring back and have it professionally cleaned by one of our experts in store. Visit our established King Street store in Manchester, or contact us to discuss your options.